Negative Houses shows FACS to be fairly deep in the lineage of Chicago's long, storied history of dissonant post-punk. In what turned out to be a kind of parting statement, the Chicago band Disappears lurched toward a frontier of unlit and spacious corners on their final album, Irreal. FACS, featuring Brian Case and Noah Leger of Disappears, set off like a lunar module from its command craft, venturing out to probe the darkness further and challenge the void to a staring contest. Disappears distinguished themselves in the realm of independent rock with a run of bracing, unflinching albums on the impeccable Kranky label in the first half of the 2010s. When bassist Damon Carruesco's decided in the fall of 2016 to leave the band to give more attention to his other creative endeavors, the result could have been a blank spot scratched into the map Disappears were still in the process of drawing, terrain that would have to wait in hopes of one day being surveyed. The good news, of course, was that things didn't turn out that way. FACS quickly picked up as a trio where Disappears left off, and though the reconfigured chemistry produces different results, and they've found a new home with the label Trouble in Mind, a similar convergence of chilled sensuality and heated threat hangs like a heavy mist over Negative Houses. Back beyond Disappears, founding member Case spent time in the late '90s math aggressors 90 Day Men, which places FACS fairly deep in the lineage of Chicago's long, storied history of dissonant post-punk. This background has a way of informing choices etched into their grooves, even if in a more inherent way than by any conscious decision making on their part. 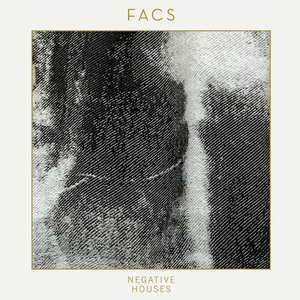 Establishing continuity amidst the changes to their name and line up, FACS recorded Negative Houses in the house that Steve Albini built, Electrical Audio, with producer John Congleton. It is the same pairing of man and machine that paid off for Disappears. The choice of location and Congleton, despite his having worked on many a layered and lush rock album, works well to bring out FACS' steel stalagmite clang and hollowing howl. "I am skylarking / You are skylarking," repeats Case on the opening "Skylarking", his words of sinister air forming clouds from between clenched teeth in a subzero meat locker. Despite his assertion, it doesn't sound like either party in question is just having a bit of lighthearted fun. "Try everything, and you might find something that's true," he goes on, offering more free-spirited advice than one might expect from someone who chooses their words carefully and uses them sparingly. The atmosphere is paramount throughout Negative Houses, and Case's lyrics do more in the way of bolstering motifs than conveying narrative. If it isn't quite the point to find the universal in the abstract, the less-is-more approach can produce neat lyrical bends such as deleting 'yourself' in "Just a Mirror": "Just see yourself / Just see", "Don't believe yourself / Don't believe." FACS could have easily masked their reduced numbers by piling up instrument tracks on these songs, but aside from supplementary flourishes like the spectral saxophone that penetrates the airy haunted hallways of "Houses Breathing", Case, Leger and Jonathan van Herik (who since the recording of the album has been replaced in another slight shuffle by Alianna Kalaba, formerly of We Ragazzi and Crocodiles) don't overcommit to tape at the risk of potentially under-delivering in a live setting. Commitment is a character trait of Negative Houses; present in the weight of Leger's drum hits on "Silencing" and his patient restraint on "Houses Breathing", in Case's never breaking eye contact even when breaking into a cold sweat. "Unfeeling power / Take me now" he seems to concede as tension mounts on "Just a Mirror", but FACS have every bit the will to fight and the means to do it as their former incarnation.